Have you ever heard the phrase “that person has the mind of a five year old In an adult body?” It is something many adults with intellectual disabilities, like me, have to deal with. For years, medical professionals have told parents of newly diagnosed Intellectually disabled people that they would mentally be children for their entire lives. Even through I am a 28-year-old, pregnant, married adult, as well as a faculty member at University of Washington, people still tell me that I think like a child. These words are not just offensive language. They can also take away our rights to normal adult lives. Historically, so-called “mental age theory” has stripped people with intellectual and developmental disabilities of our dignity, our reproductive freedom and our parental rights. Age theory has also been used to strip us of the rights to make adult choices, such as buying alcohol and tobacco or having sexual relationships. “Mental age theory” was a major feature of the eugenics movement. In many ways, it was also the forerunner of modern-day functioning labels. 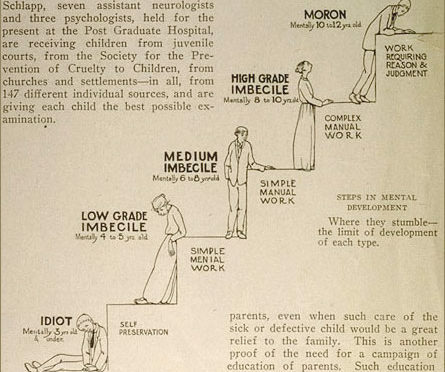 At the turn of the 20th century, intellectual disability was called “feeblemindedness” and was separated into categories: A moron was somebody who had the mental age of a 9-12 years old, an imbecile was someone with the mental age of a 6-8 year old, and an idiot was some with the mental age or a 2-5 year old. In Buck v. Bell, a case that legalized forced sterilization of disabled adults, Chief Justice Oliver Wendell Holmes remarked, “three generations of imbeciles is enough” as justification for forced sterilization of people with intellectual disabilities. It was also used to deny us of our freedom and force us to live in institutions. I work for the University of Washington’s LEND, which is leadership interdisciplinary training for medical professionals. Sometimes medical professionals I work with forget history. I sometimes have to remind them that it is very harmful to use mental age theory when speaking with new parents. Mental age theory discourages parents from teaching their disabled offspring their rights to independence and autonomy. A lot of my friends with intellectual disabilities have been mislead by mental age theory. They feel they will never gain independence or get married because they have been told they are children and treated like children for their entire lives. This is why I advocate for people to not use mental age theory at all. We need to tell media they shouldn’t use it to describe disabled adults who are lost or wandering. We need to educate medical professionals that there are better and more respectful way to explain the needs of people with Intellectual/developmental disabilities. Difficulty doing specific tasks isn’t the same thing as being an actual child. We also need to stop thinking that just because a person likes things that are considered childish, that person is still an adult with the same needs and desires as other adults. I love my little wookies, but I am still an adult. I know many adults without disabilities that enjoy child-like things like cartoons or toys. People with Intellectual and developmental disabilities are treated differently for liking the same things. It’s funny when I meet with non disabled people and they geek out over my little plushy wookies I carry as comfort items. It shows me that adults can enjoy things that children enjoy without people assuming that they are mental children. Please consider this when you hear phrases like “the mind of a five year old” used to talk about adults. Educate people that it is not accurate or appropriate to refer someone with intellectual and developmental disabilities as mentally younger then they are! I not mentally 12. I am mentally 28. I just have an intellectual disability. Thank you.. well written and point taken. Thank you, Ivanova. I am a psychology LEND trainee, and reading about your perspective and experience with mental age theory was really helpful! You’re absolutely right. Very well said. Well said. I use acalculator for even the most embarrassingly simple calculations. Yet, I am never described as having “the arithmetic age of a 10-year-old”. That would be ridiculous. I also wrote o this a while ago. Great article Ivanova! I agree! Mental age and all labels do not help people understand the true capabilities of an individual and result in denial of equal rights and limitations on equity of opportunity. I remember these categories when I started college. Little did I know that I would end up teaching Special Ed. classes for 29 years. I was continually amazed by these students’ abilities when given a chance. Lables restrict people. They do nothing to help them grow to their fullest potential. A powerful piece of writing. Thank you for the reminder! Thank you so much for this article. As the mom of a child with Down Syndrome, this was what I’ve been wanting to hear. Now to educate the medical and school professionals, and the general population. Time to see the whole person, and not use labels to make assumptions, or create limitations. This seems fairly straightforward: Some people have high support needs. Some people have higher support needs than others. Some people’s support needs involve help taking transportation, or tying shoes, or getting a diaper changed. Support needs do not transform adults into children. Your son does not have the (insert thing here) of a toddler. He’s an adult man who needs extra help being safe around traffic. It’s about respect. You can respect someone and acknowledge they need assistance to do their best at the same time. Absolutely correct – support needs do not transform adults into children. Neither does saying “having the emotional maturity of a toddler” transform my son into child – it is a way of easily categorizing the behavior that my adult son exhibits and one that is easily recognizable by those who may be unfamiliar with adults who may need a high level of support to stay safe in pubic places. It also has to do with knowing people – you don’t know me or my son and so may be reading this from a totally different perspective from people who have met us or have worked with us over the years. I did notice that you mentioned “getting a diaper changed” I have been instructed by disability advocates not to use the term “diaper” since it is related to babies – we were to use the term “wraps” – just curious on your perspective of this? You son has a Intellectual disability. I did not take away that “label”. I saying he not a child he has 24 years of experience in age that make him not under 24 mentally. Mental age has nothing to do with support Needs. Stephan hawking needs personal support needs. Yet can know how not call him mentally a child. Why is it considered ok to do this to intellectually disabled when we need supports but then think it not ok with those with physical disabilities to call them children for having support needs? Isn’t ok either way! Just because a person needs assist figuring out traffic don’t not mean they are a child. That not taking away identity or what you call “label” and being more accurate and respecting the person humanity and age! Not taking away there rights. Allowing autonomy that adults gain. “Having emotional maturity of a toddler”………that still mental age theory. As person who still has public maltdowns as adult I be very offended if someone discribled me that way. That really demeaning and that still supports mental age theory…..it not good way to discrible person support needs or emotional regulation struggles. I think wipes better term then diaper. There other activists that have written about diaper issue to. When I was 24, I was different than you were at 24, and we were each different from Laura Ivanova Smith. All three of us were different from your son at 24. People differ. And we can say all of that without being rude to anyone. This article is fantastic. Thanks for your insights- i’ve shared it! I going to share some examples people can to explain their love one support needs that don’t use mental age theory. I some people being asking me for alternatives. Ivanova needs help with cooking they have sensory issue and may not be able to tell how hot temperatures on starve are. They have someone do the cooking for them. Ivanova can’t drive due to developmental disability that cause they to have struggles with multitasking and hand eye cordination. Ivan needs help acrossinf busy streets because they don’t understand traffic very will and need support to be safe. Ivan may need support with emotional regulation because they process emotions differently then other people. There many ways to explain mental age theory without using mental age! Please try out these alternatives! In last sentence I meant to say there are ways to explain support needs with out using mental age theory. I have a question… I have an 8 yr old son, who is developmentally delayed. I think as he gets older this will have less impact, as he does continue to grow and develop, just slower than his peers. But what this means is that he is often not emotionally ready for the same thing his peers are, and I often try to explain to his school teachers, that his emotional maturity is more like that of a 4 -5 yr old. I come to that conclusion by reviewing developmental milestones that are offered for children. Should I not do this? I wouldn’t do this if he were an adult, but as a child I feel it is important to let some people know that he isn’t ready for something, YET. He is also large for his age, which tends to let people think he is far older than he even is. But I am interested in others perspective on this, other than my own. Hello Donna, that is interesting situation. I think that reminds of how malnourishment affected my development in first years of life. I was born with developmental delays and when I was adoption I size of younger age. I think it important to be specific to motor function and not on the age. I see age something gain in experience and not development development is how fast or slow body grows function and not really have to deal how long person been born. I can say I developed slowly I did not learn to speak till five and half. My learning was slowed but that don’t change fact I have 28 years of experience. When I was five I was not mentally younger but my body developed at slower rate then those around me. That don’t effect time. I still lived on this earth for sudden amount of time that affect how old I am. example. John body grows at slower rate this may affect memory and learning. He may learn in different way. I once saw a documentary about a boy with shaken baby syndrome. He was born in October 1995, shaken in January 1996. (He is now almost 22.) He could still understand language and his environment. His mother called him “a 13-year-old who is mentally 5 or 6.” Now, this mother seemed very cold throughout the entire film. I wonder what he would have thought about her saying that. My son Stephen Green is the first person with Down syndrome to be elected to any Parish Council in England. He is now 52 I am 74. When he was a school boy Stephen took part in the very first Special Olympics at Liverpool. At that time he could just about swim one length, of our local swimming pool. 1990 Stephen took part in a National challenge to swim 90 miles in 1990. We turned his swim, into a sponsored one, because our local council refused to provide a pool hoist for one of our swimmers who needed assistance. This swimmer was multiple handicapped, blind and in a wheel chair. Council logic for the refusal of the Pool Hoist being, there are not enough disabled people using the pool to warrant one. That was 17 years ago. Father who brought his son used to change him on a towel on the changing room floor, then lift him into his wheel chair, to take him to the pool side. At the pool side he would lift his son out of his wheel chair, one of us would hold him while dad got into the water, to help his son in. Stephen raised most of the money for the Pool Hoist and in the end Broxtowe Borough council put some money in, as did our Leisure Centre. Stephen’s friend was able to enter the water with dignity with the aid of the pool hoist. Councillor who would not help with the pool hoist has had a lifetime in education and was not at all welcoming to Stephen when he was ELECTED onto Nuthall Parish Council. Nuthall Parish Council is wonderful. And pool hoists are very important for all us swimmers. Thank you for this very well-written article. I have been teaching the indignity and incorrectness of the mental-age equivalency model now for decades. It is very important. It is gratifying to see someone else point out the multiple problems that lean toward denigrating the humanity of children/adults with disabilities. Please continue to share your work. In my work as a forensic psychologist I teach responders to alleged crimes (law enforcement, investigators, prosecutors, judges, forensic interviewers, the error of the concept of mental age “assignment.” Using it causes the user to “assume” many incorrect things. The appellation itself is demeaning. Thank you. To my friend, Ivanova. Love this article! You are spot on with your views. I have always felt this same feeling about so-called labeling of what one thinks another is capable of. Mental age theory is really a stripping of human integrity, and a blow to one’s human potential. You are amazing and I am proud to know you and to be writing a book with you! I’m autistic and people sometimes guessed that my sister who’s younger is older than me. That’s likely something to do with my facial expressions. At other times, the same people might say that I look more mature. I don’t think the terms emotional or social maturity should be used to describe disabilities either. Risking looking not mature enough or making inappropriate facial expressions might be why I’m pressured to pass as non-autistic. “Thank you” Ivanova for your very helpful article. As a parent I am grateful for your examples and for the truly respectful way of explaining support needs for my children .